Margie comes originally from the North of England but, as a child, lived in Canada. She is married to Richard and has three married grown up children and 10 grandchildren. She has lived in Spain since 2007, leaving a long career in Social Work. Having worked in many different services including the Elderly, Health and Disability, Probation, Child Protection and Initial Assessment, she settled on Adoption and Fostering as her career choice for 18 years. She loved managing the thriving teams but also used her expertise as Expert Witness in the London Courts for Adoption issues. She worked directly with abused children and attachment problems within adoptive and long term fostering families. Before coming to Spain, she was asked to set up a Fostering Agency in the Bath area and enjoyed the challenge of building this up. She has both trained and assessed prospective adoptive and fostering families, as well as training social workers in direct work with children. Margie has done lots of training for her work but also training in Christian outreach and working with children and youth work in Essex. She loves writing and has written books within social services but now enjoys a daily thought for the facebook page which she and her husband set up for Llanos Church. She enjoys this very much and also loves sharing Bible Studies and anything which involves sharing the good news of Jesus. She has a BSc, an MSc, and CQSW, all from the London School of Economics and with her Phd. was asked to be an Honorary Professor at the Chelmer Institute. She has recently completed the Certificate in Christian Studies which has enabled her to become a Reader for the Diocese, a ministry she loves. She is also a qualified counsellor and worked voluntarily for the Samaritans, work she found very fulfilling. 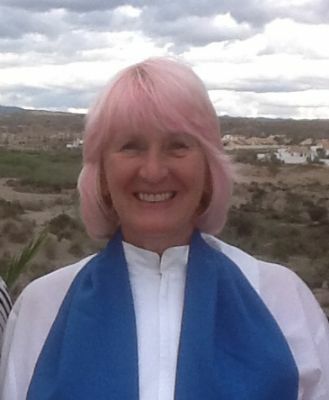 Margie was licensed as a Reader in the Chaplaincy of Costa Calida and Costa Almeria on the 28th October 2018 by Archdeacon Geoff Johnson at Llanos del Peral.